Dispatch And Trip Reports meet International Fuel Tax Agreement (IFTA) and International Registration Plan (IRP) requirements. Provide space for recording shipper/consignee data, fuel purchase, and mileage data. 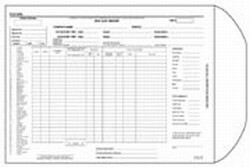 The dispatch portion of this form is for recording shipper and consignee data, loading and delivery date and time, and stop-off points. 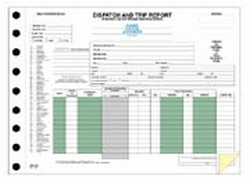 Record required state fuel purchase and mileage information in the trip report section. Includes instructions. Available in padded or snap-out formats, vertical and horizontal versions. Use this envelope for storing expense receipts. Has spaces for itemizing miles driven, highways used, states traveled, and expenses along the way. Side opening, 12" x 9".